TMLF wanted to add to the tributes to the spirit and strength of the City of Manchester following the Arena Bombing. M20 Property Company have generously donated the use of a building they own at 701 Princess Road for artworks dedicated to Manchester, by Manchester artists. This has been named “The Khazi Project” in recognition of the buildings heritage. 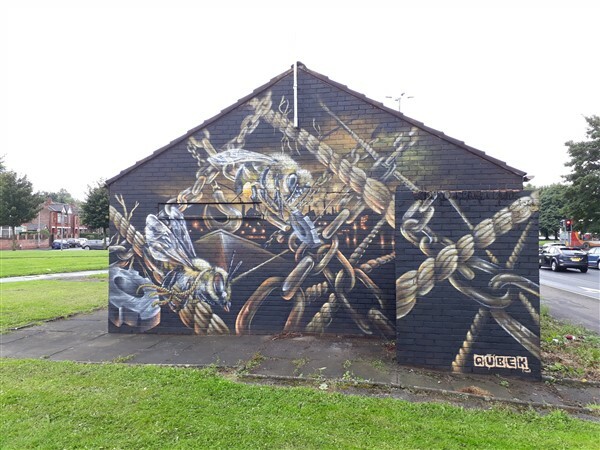 QUBEK, who has become renowned for his Bees has created a powerful tribute to the industrial heritage with the bees against a background of an industrial skyline, cotton threads, and chains broken to represent the abolition of slavery. This work is soon to be extended onto the adjoining wall. 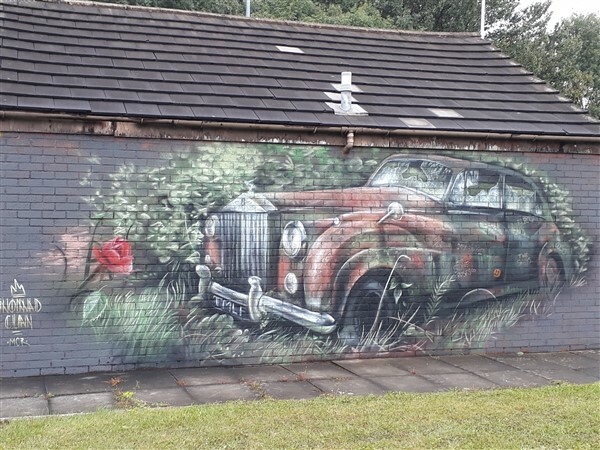 NOMAD CLAN have painted a dilapidated vintage Rolls Royce as Charles Rolls met Henry Royce in Manchester. The car includes other Manchester references including Rutherford’s splitting the atom and Manchester Bands including The Stone Roses and Elbow. TANKPETROL will be painting a famous Manchester face on the remaining wall soon……so watch this space to see who it will be.